This morning, Pope Francis received in audience the Delegations from Trentino and of the Bavarian municipalities of Hirschau, Schnaittenbach and Freudenberg for the gift of the Crib and of the Christmas Tree set up in Saint Peter’s Square. I give you my cordial welcome and I thank you for the gifts you prepared. They are very beautiful, and it gives me joy that you did not present them only to the Pope and to the pilgrims that will be able to admire them, but above all to the Lord Jesus, because He is the one celebrated! I thank Monsignor Voderholzer and Monsignor Bressan, Mrs. Merk, Mr. Falk and Mister Thun for their courteous intentions, for the help, and for the projects. And I greet you all: the Authorities of the Bavarian municipalities of Hirschau, Schnaittenbach and Freudenberg, who donated the Christmas tree; the Representatives of the Province of Trento, who together with the Archdiocese, prepared the Crib. 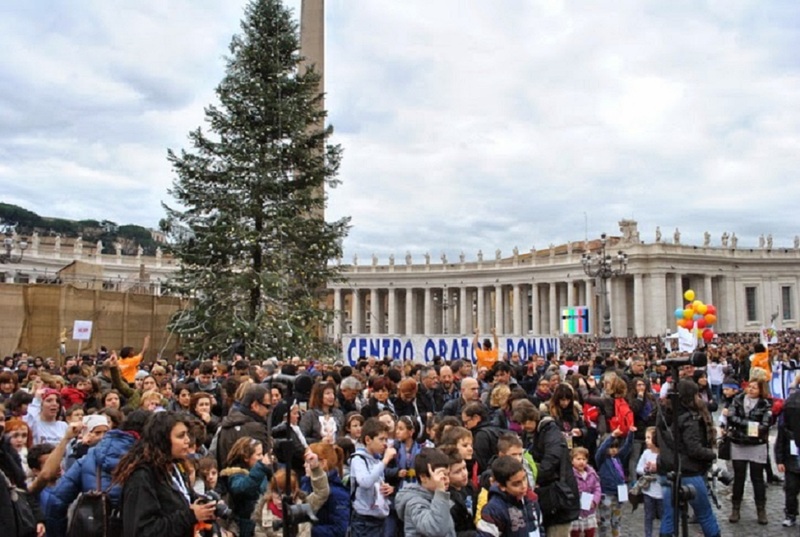 I would also like to thank the little “artists” who decorated the tree, and congratulate them: you are still very young, but you already exhibit your works in Saint Peter’s Square! And this is good. Courage, forward! Michelangelo began this way! The decorations, that thanks to the work of the “Lene Thun Foundation” you arranged, represent your dreams. These desires that you carry in your heart are now in the most appropriate place, because they are close to the Child of Bethlehem: they are entrusted to Him, who came to “dwell among us” (John 1:14). In fact, Jesus did not simply appear on earth, He did not dedicate a bit of His time to us, but He came to share our life, to receive our desires, because He wanted, and still wants to live here, together with us and for us. He has our world at heart, which at Christmas became His world. The Crib reminds us of this: God, because of His great mercy, came down to us to remain stably with us. Moreover, the Crib tells us that He never imposes Himself by force. Remember this well, you children and youngsters: the Lord never imposes Himself by force. To save us, He did not work a grandiose miracle. God does not like the imposing revolutions of the powerful of history, and He does not use a magic wand to change situations. Instead, He makes Himself small, He makes Himself a child, to attract us with love, to touch our hearts with His humble kindness; to shake, with His poverty, all those who are intent on accumulating the false treasures of this world. These were also the intentions of Saint Francis, when he invented the Crib. He – Franciscan sources tell us – “wanted to remember that Child that was born at Bethlehem,” to be able “in some way to perceive with the eyes of the body the hardships in which He found Himself because of the lack of the necessary things for a new-born.” In that scene, in fact, “simplicity is honored, poverty is exalted, humility is praised” (468-469). Therefore, I invite you to pause before the Crib, because God’s tenderness speaks to us there. We contemplate there divine mercy, which made itself human flesh and can soften our looks. Above all, however, He wants to move our hearts. It is good that a figure is present in this Crib that accepts immediately the mystery of Christmas. It is the personage that carried out a good work, kneeling to offer help to an elderly man. Not only does he look at God, but he also imitates Him because, like God, he kneels with mercy toward one in need. May your gifts, which will be illuminated this evening, be able to attract many looks and especially revive in life the true light of Christmas. I thank you! And, please, do not forget to pray for me. Thank you.